Lent is often viewed as a journey where the faithful spiritually accompany Christ on his way through Calvary to the empty tomb of Easter. This tradition is rooted in the early history of the Church. In the fourth and fifth centuries, the bishop of Rome began visiting his parish churches on a regular basis. There are more station churches than there are days of Lent so some churches are assigned days during other parts of the liturgical year. But Lent is a season where the station churches are given special attention. The pope continues to celebrate Ash Wednesday Mass at the Basilica of Santa Sabina, the first of the station churches, and he will sometimes visit other parishes on the Sundays of Lent, as he did on Feb. 24. Over the years, archdiocesan seminarians and priests studying in the Eternal City have participated in this devotion of visiting the station churches. Seminarian Sean Danda is in his third year of studies at the Pontifical North American College in Rome (NAC), and came to value the station churches after his first Ash Wednesday visit to Santa Sabina. Although the tradition is in many ways unbroken, it hasn’t always been as strongly attended to as it is at present. When Msgr. Frederick Easton, archdiocesan vicar judicial, was studying canon law in Rome during the late 1960s, it was more difficult to make it to the churches for Mass in English. But he at least made the effort to visit many of the churches sometime during the day. By the early 1970s, however, the seminarians at the NAC had started to follow the tradition more closely. Msgr. 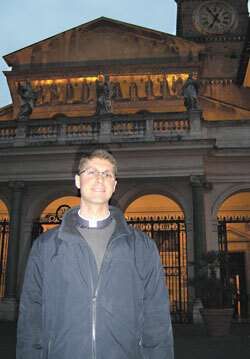 Mark Svarczkopf, pastor of Our Lady of the Greenwood Parish in Greenwood, was a seminarian there at the time. The NAC seminarians usually walk together to the churches, some of which can take an hour to reach on foot. “There is something about ‘making the journey’ together,” Danda said. “As Christians, we share the path of following Christ together. This builds brotherhood and charity. Father James Bonke, defender of the bond in the archdiocesan Metropolitan Tribunal, studied canon law in Rome in the early 1990s. He recalled that the early morning pilgrimages to the station churches had a penitential nature to them. “It could be rainy and it could be cold,” Father Bonke said. “And the cold in Rome is a damp cold. It kind of seeps through you. Msgr. Svarczkopf had a particular memory of a puddle in front of Santa Sabina. Despite such hardships, often recalled with a chuckle or wry smile, Father Bonke fondly remembered being the celebrant for the English Mass at Santa Cecilia in Trastevere, the station church for the Wednesday of the second week of Lent. Msgr. Svarczkopf returned to the NAC as a member of its faculty from 2000-03. During that time, it was his responsibility to make sure the English-speaking community had an altar available in the station churches at which they could celebrate Mass. By that point, various language groups in Rome were following the tradition closely. As a seminarian, Danda isn’t bothered with such details. He has the time to appreciate the beauty of each station church and how they are a living testimony to so many who died for the faith and made the faith what it is today. “These churches teach us that it is a beautiful faith and one worth dying for,” Danda said. “I think about the millions upon millions of pilgrims who have come to pray at these holy places.